HUGH GRANT is an award-winning actor who has received acclaim for his work in a wide range of films, which have grossed more than $2.5 billion combined worldwide. Grant can most recently be seen in the three-part BBC drama series A Very English Scandal,where he stars opposite Ben Whishaw and reunites with FLORENCE FOSTER JENKINS director Stephen Frears. 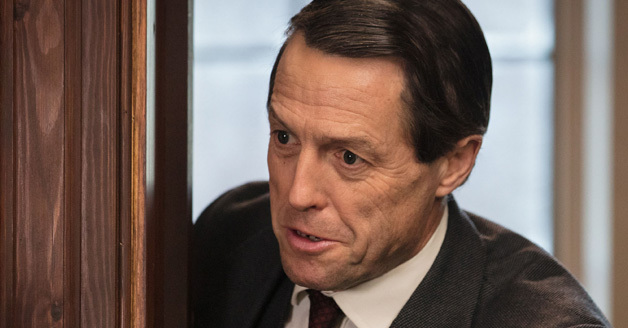 This marks Grant’s first return to television in 25 years where plays the disgraced British politician, Jeremy Thorpe, in the true-story drama. The series will also be available on Amazon Prime for American viewers on June 29th. Earlier this year, Grant starred in Paul King’s PADDINGTON 2 alongside Ben Whishaw, Sally Hawkins, Brendan Gleeson and Hugh Bonneville. The movie opened on January 12, 2018 in the US and has since gone on to make over $217 million worldwide. His performance earned rave reviews from critics and he received BAFTA and Evening Standard British Film Award nominations for the role in addition to winning “Supporting Actor of the Year” at the London Critics Circle Film Awards. In 2016, Grant starred in Stephen Frears’ comedy FLORENCE FOSTER JENKINS opposite Meryl Streep, for Paramount Pictures. His performance received critical acclaim, earning him Golden Globe, SAG, BAFTA, and Critics’ Choice nominations as well as winning Best Actor Award at The Evening Standard British Film Awards. Previously, Grant starred in Marc Lawrence’s romantic comedy THE REWRITE and Guy Ritchie’s film adaptation of the eponymous MGM series THE MAN FROM U.N.C.L.E.. In 2012, he starred in the critically acclaimed drama CLOUD ATLAS, playing multiple roles throughout the film, from the Wachowskis to Tom Tykwer. That same year, he also lent his voice to the lead role of The Pirate Captain in the animated film THE PIRATES! BAND OF MISFITS, and starred in DID YOU HEAR ABOUT THE MORGANS opposite Sarah Jessica Parker in 2009. His other film credits include MUSIC AND LYRICS, AMERICAN DREAMZ; BRIDGET JONES’ DIARY, and its sequel, BRIDGET JONES: THE EDGE OF REASON; the ensemble comedy hit LOVE ACTUALLY; and TWO WEEKS NOTICE opposite Sandra Bullock. He won a Golden Globe Award and a BAFTA for his performance in FOUR WEDDINGS AND A FUNERAL, and was nominated for Golden Globes for his performances in NOTTING HILL and ABOUT A BOY. Among his many feature film credits are AN AWFULLY BIG ADVENTURE, THE ENGLISHMAN WHO WENT UP A HILL BUT CAME DOWN A MOUNTAIN, SENSE AND SENSIBILITY, MICKEY BLUE EYES, SMALL TIME CROOKS, and EXTREME MEASURES which he also produced. In addition to his Golden Globe and BAFTA honors, Grant has been awarded The Peter Sellers Award for Comedy, Best Actor at The Venice Film Festival and an Honorary César Award. Grant is also on the board of Hacked Off, which was started in response to the News International phone hacking scandal and campaigns for a free and accountable press.